Learning about and caring for our native UK pollinators! During the late spring and summer months Red Mason Bees and other pollinators will be busy outside collecting pollen and nectar to line the chambers where they they have laid their eggs.To support this activity and promote awareness about the important work insects perform pollinating crops, schools in The Perfect Pollinators Red Mason Bee Project will be taking part in the exciting events listed below. Making our school grounds pollinator friendly! The best time to plant meadow seeds is late September/early October or early spring. A small meadow area just 5 metres by 2 metres is sufficient to support and provide pollen for up to 20 Red Mason Bees. 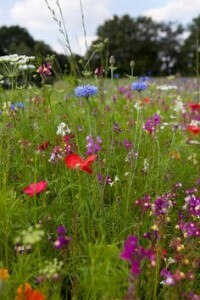 To give your meadow seeds the best possible chance of growing and flowering consider planting on a patch of ground that is not too wet or shady. If you don’t have sufficient space to grow a Mini Meadow in your school grounds, then why not sow your seeds in several pots or window boxes? To help you get started – Receive a bag of free meadow seeds from Friends of the Earth! Friends of the Earth (FoE) are giving schools that take part in their Soil Sample Survey a bag of free meadow seed! Click here to find out how your school can receive a bag of seeds selected to match your soil type. 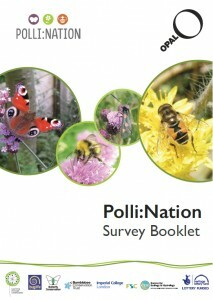 Help scientists assess the state of our UK pollinators – Take part in the Polli Nation Survey! Numbers of pollinating insects have fallen dramatically in the past ten to twenty years. To understand what is happening and to inform environmental groups about the threats and what needs to be done to protect UK pollinators schools across the UK are being invited to collect and submit data to this survey. How to take part? Schools can contribute to the project by recording this summer all pollinators that visit a small meadow area (10 metres by 10 metres) in their school grounds. For information about how to join the project and take part click here. 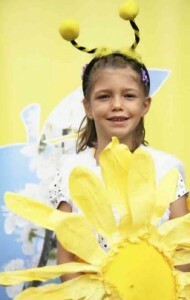 Share your knowledge with others - Plan a Bee day in your school! Consider hosting a Bee day in your school this summer. Let the day be an opportunity for your pupils to learn about pollinators, food chains, reproduction and the life cycles of green plants. Your special day might include an assembly, games, a bee quiz, treasure hunt, planting shrubs, herbs and flowers and pupils hanging bee hotels. Looking for ideas to help you get started? Download your own copy of : The Friend’s of the Earth Bee Cause Pack for Educators. Do you have the skills to edit video clips? Maybe you prefer making animated cartoons using a program like 2Animate. If the answer is “yes” then why not use make your own short video about The Red Mason Bee or the important work that Pollinators perform and showcase your work here on the SeeNature website for others to watch.